Why talk about the “living” when they´re handsomely compensated to elucubrate about the “dead”? And the “dead”, as you may have surmised, is Inflation! 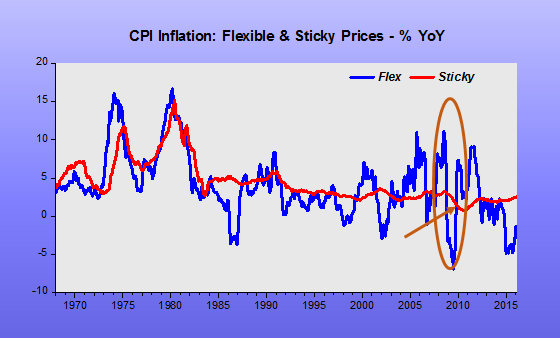 As the chart depicting (from the Atlanta Fed Inflation Project) the flexible and sticky CPI YoY inflation makes very clear, inflation has been dead for at least a quarter century. When you have price shocks like in the 00s, where between 2003 and 2008 oil shocks were prevalent, the flexible components “swing along” while the sticky components “stay put”. That´s the outcome when the Fed is successful in maintaining nominal stability (satisfactory NGDP growth along an adequate trend path). When, as in 2008, the Fed, suddenly fearful of price shocks that disturb the flexible components, engineers a massive demand shock (deep drop in NGDP) to quench “inflation”, the result is a long depression! Note that even the sticky prices are affected! To justify their handsome remuneration, our sages at the Fed keep “talking-up” a problem that has long been dead. Much easier than worry about the (sometime barely) living! The Atlanta Fed´s “inflation project” provides us with alternative measures of CPI inflation. It separates flexible prices from sticky prices and, in addition, subdivides both the flexible and sticky components into their core measures. 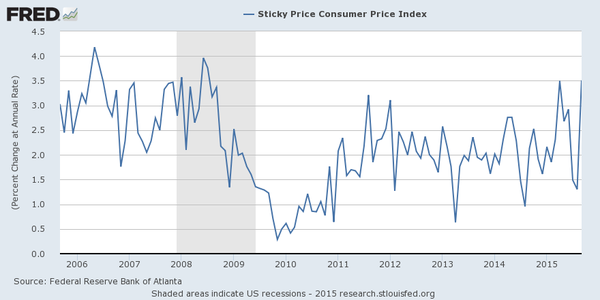 It also provides the sticky measures excluding shelter inflation. 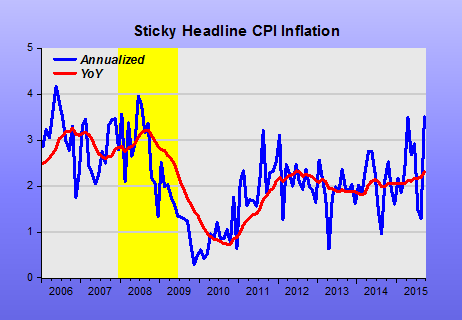 Yesterday, the St Louis Fed tweeted the following chart, indicating that headline sticky annualized CPI inflation had reached 3.5% (Oh my God!) in September. This week, expectations of a Fed rate hike have moved back from the December meeting toward the March meeting. That would be helpful, given that outside of the rent inflation caused by the housing supply depression inflation continues to be at a 50 year low. 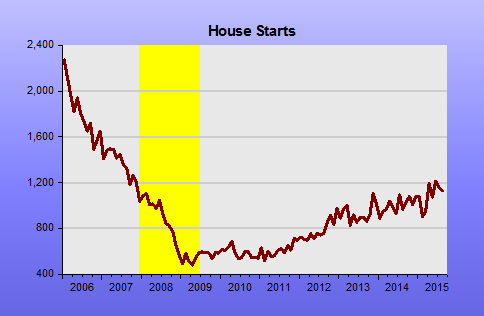 In the meantime, considering the decade long depression-level behavior of housing starts, calls for monetary contraction because of inflation that is largely the product of rising rents are indefensible. My point is that a target that has “multiple faces” is a dangerous target indeed! In addition, presenting the multiple-faced target in a noisy format (annualized rates), is “criminal”. Superimposing the headline sticky year on year (YoY) rate to the headline sticky annualized CPI inflation tweeted by the St Louis Fed, we get a very different picture of trend inflation. 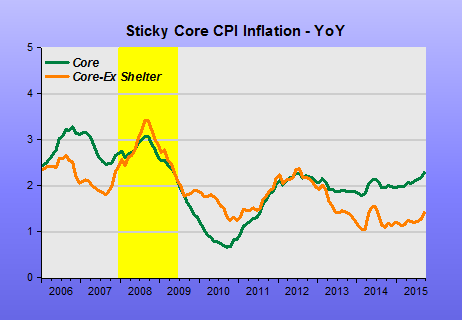 And comparing the sticky YoY Core-CPI with the sticky YoY Core CPI-Ex shelter we see the reason for Kevin´s conclusion. For some time the economy has been ‘playing tricks’ on policymakers, in particular those at the Fed, concerned with monetary policy. For more than one year, they have been signaling that the beginning of ‘policy normalization’ (aka the first rise in rates) was imminent, but at each turn something happened to thwart their ‘desire’. It´s interesting to note, in that context, the ‘bias’ in some of the research being done at the research departments of the Federal Reserve System. Some would indicate that the Fed should start the normalization process now. Others that it could still wait a while. The Fed has a difficult job. It must assess how close the U.S. is to full labor force utilization, and how that translates into inflation risk. Both steps of that process involve considerable uncertainty. The Atlanta Fed’s new ZPOP measure attempts to provide additional clarity, but as the researchers acknowledge, this measure isn’t perfect. In the end, the Fed will always have to make its monetary policy decisions based on incomplete information about the economy. 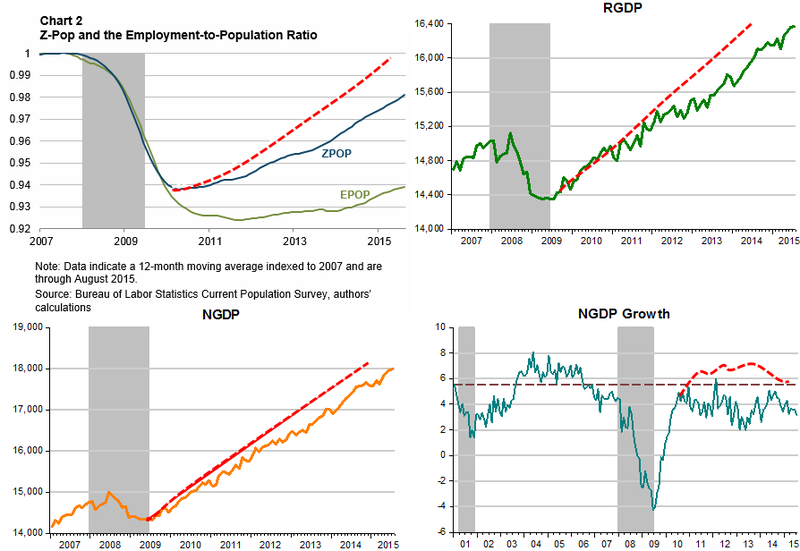 The panel below extends the ZPOP chart of Thoma and the Atlanta Fed to show how the story could have been different (and we wouldn´t be unduly worried about what´s the best measure of inflation expectations, interest rates being below the ‘natural rate’ or what´s the better labor market indicator). First off, the best thing would have been for the Fed NOT to allow nominal spending (NGDP) to tank! Since it did, the best thing would have been to crank it up at a higher rate, to try and get as close as possible to the original trend level path. Don´t argue that was not possible, because if the Fed can ‘choose’ one level of spending it can ‘choose’ any. And look how it allowed NGDP to grow at a higher rate after the mistake of 2001/02. This time around, it stopped the rise in NGDP growth too soon! The Fed has allowed the economy to remain ‘depressed’. And in a ‘depressed’ economy, the ‘gauges’ of performance (most likely) behave differently, and that´s causing a lot of anxiety. Neither conventional nor unconventional monetary policy has much of an impact on employment. What does? Factors that drive the labor-leisure decision. It is getting harder and harder to keep a straight face and say the U.S. Federal Reserve should tighten money. So, let’s see, Q1 was dead, and Q3 will be dead, in terms of real GDP growth. And Q2 would have been tossed back into the water in most of the 1990s. But Janet Yellen and the Fed are still talking about those rate hikes. They sound like a crack-head discussing the next coke fix—there is no other topic in the room. I have a really bad feeling that what the Fed should be discussing is QE and wiping out IOER. But they can’t. It would not be PC. The Fed is trapped appeasing the utopian monetary dogmas of partisan-eccentrics, and by its own institutional hubris and rigidities. You will never hear a speech like that from the Fed. Dudes, this could get ugly. The Atlanta Fed, usually a quiescent bunch, just X’ed out growth in its Q1 forecast GDPNow index. Of course, headline inflation is at 0% and rates on 10-year Treasuries are skidding below 2%. Hiring is seizing up, the Dow is stutter-stepping, and unit labor costs have not risen in six years. The Fed is endlessly jibber-jabbering about raising rates and getting back to normal. I have some advice for the Fed: From the clues I detect, raising rates will not get you back to normal. My other advice to the Fed is to send reconnaissance teams to Europe and Japan. It you think now is not normal, wait ‘till you see what comes next. I have been tooting all along that the Fed should stay with QE, adding my kazoo to the cacophonic, conductor-less global orchestra of macroeconomic e-pundits. But, perhaps it wouldn’t matter if I had Gabriel’s Trumpet, and not a kazoo.